In late May, I accepted a position with NFL.com as a fantasy football writer and editor. While this is a major step in my career, and I am beyond thrilled to make football my “real job”, it also means things must change with the Reception Perception project. With this new job, I will be expected to relocate to Las Angeles, California before starting in July. I currently live in the Washington D.C. area, so this will mean a large transition. Much of the time I was expecting to use completing the 2015 Reception Perception publication will be dedicated to moving across the country. Unfortunately, that meant canceling any plans of releasing a Reception Perception book, as planned this year. However, I will still aim to put out a publication in the offseason following the 2015 season. So please stay tuned with the series as it grows towards the goal. As a holdover, all Year 1 results can be found in this database. For now, I will continue to publish articles both on Backyard Banter and Footballguys detailing some of the findings from this year's charting, in addition to analysis during the season. Just head to the bottom of this page to take those pieces in. Thank you so much for your interest and support this offseason. You all helped take Reception Perception to heights I never imagined it would go. Without you, I would not be where I am today. Last summer, I debuted Reception Perception and the process for the charting here on Backyard Banter. The full-season Reception Perception process used an eight game sample to gain a full scope of who a receiver is as a player. Soon after the debut, Cordarrelle Patterson and Jordy Nelson were put through the study, and featured on the site. When Footballguys hired me, I brought Reception Perception along to that venue. Almost every week, I profiled a new receiver for FBG. The pieces took on more of a fantasy spin, using only a one game sample. The featured receivers included Odell Beckham Jr., Jeremy Maclin, Brian Quick and Julio Jones. All of the articles in that incarnation of Reception Perception can be found here. With the regular season finished, its time to ask: what comes next for Reception Perception? The plan is to release an eBook or downloadable PDF with a wide variety of relevant NFL receiver put through the eight-game sample methodology. That sounds like a wide net, and it certainly is. However, receivers must have at least eight games with at least 20 snaps to qualify, so that will narrow the playing field. To make the eBook, they will also need to have played at least 300 snaps on the season. Not all receivers will have full write ups, but readers will get all the Reception Perception numbers for every player featured. I’ll dive into more impressive, poor, or surprising performances in-depth throughout the book. For now, there is no set release date for the Reception Perception booklet. The loose plan is to have this thing ready for you some time after the NFL Draft. This will serve to drum up conversation during the dull months of the offseason, and allow Reception Perception to be used as a tool for fantasy season preparation. Since the creation of Reception Perception, my goal has been to bring a solid process for evaluating wide receivers. I believe this process does that. In my opinion, when all the numbers come together, and are used in harmony, Reception Perception paints a fine picture of the type of receiver a player is, how their team uses them and what they do well. This is my favorite position in football, and it’s a blast to study it from every angle. I’ve received a ton of positive feedback on the series so far, which is so greatly appreciated. What Reception Perception has always lacked is context, and the ability to really weigh one receiver against another. Releasing this project, with each receiver given a full season scope, should alleviate that concern. So, thank you all for your interest in this new chapter of Reception Perception. I encourage you all to continue to come back to Backyard Banter from here to the release of the eBook. Throughout my charting, I’m sure a few performances and trends will catch my eye. When those happen, I’ll put a post up here relaying what I’m seeing. Call it a teaser. PPR Fantasy Points on each route (PTS) – this helps shed light on just how a receiver is amassing their production. A visual learner, you say? Well, you can see the series' data points explained in a video format, for your convenience. If you have questions about Reception Perception, please contact me on Twitter (@MattHarmon_BYB), or through my email (mharmon2570@gmail.com). Any comments, feedback or critiques are appreciated. If you are looking for examples of the data you get from Reception Perception, here's Antonio Brown's numbers from his entire 2014 sample. You can see here which routes Brown runs most frequently (post, nines, slants) and ones he does not run as often (outs, digs, screens). This chart shows you how often Brown beat the defense's coverage on each given route. Remember, its helpful to use this chart is conjunction with the Route Percentage Chart to put everything into context. 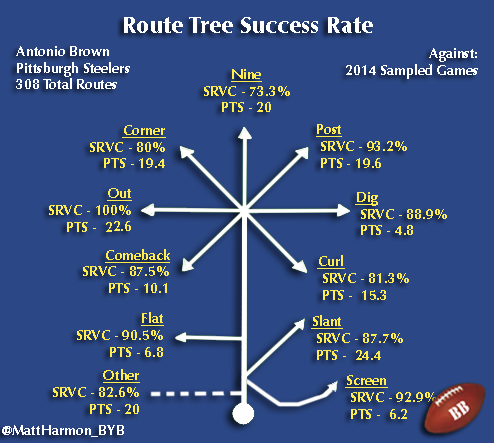 Knowing that Brown ran a slant on 18.5% of the routes charted, it makes his SRVC score of 87.7% all the more impressive, and shows his PTS of 24.4 is steady production. You can also learn that while Brown did not run corners and outs all that often, he made most of big plays on those routes. They were not some of his most used routes on the percentage chart, but his SRVC and PTS marks were very high on corners and outs. You get everything from this spread sheet. 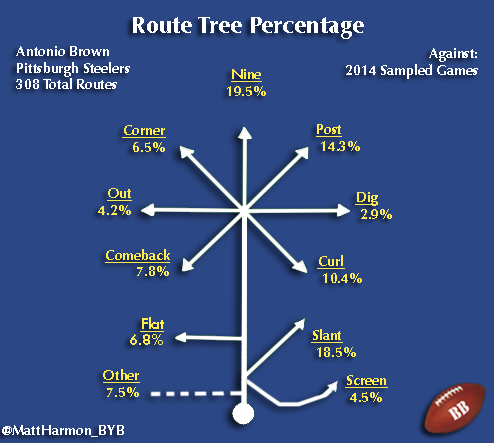 Reception Perception gives you hard numbers on how good Brown is at contested catches (81.8% conversion rate), how often he beats coverage (man - 79.7% and zones - 93.6%) and how often he was targeted per route (31.8% of routes). That is just the beginning, as you can see there are many more numbers to dig in to. So, there you have it; a sample of the wide array of data you get by following Reception Perception. Make sure to use the #ReceptionPerception hashtag on Twitter so you follow along with the series, and be ready to get your hands on the full publication this summer.